Santa Cruz II is a replacement for the much-loved Santa Cruz, which plied the waters of the Galapagos for 36 years. It is not a new ship; it was built in 2002 and sailed as Mare Australis under the Australis cruise brand, operating expedition cruises around Cape Horn and to Antarctica. Metropolitan Touring bought the ship in 2015 and completely refurbished it, launching it as Santa Cruz II in October 2015. The five-deck ship looks and feels brand new, from the public areas to the cabins and bathrooms, all of which have been given a stylish, contemporary design by experienced ship designer Richard Nilsson. Santa Cruz II is an expedition ship, not a "cruise" ship in the traditional sense, so do not expect a cruise director, a show every night or a casino. The emphasis is on what you see and experience off the ship. Having said that, you certainly won't be roughing it; the ship offers very high comfort levels, superb food, outstanding guides and excellent facilities. One of the real stand-out aspects is the service, which is unfailingly polite and friendly. It might be a cliche, but the atmosphere is like that of an extended family that welcomes you in. It's not surprising: Most of the crew have been with the company for 10 to 20 (and in one or two cases, 30-plus) years, and all served onboard Santa Cruz. The ship's eco-credentials are second to none. Metropolitan Touring pioneered recycling both on land and at sea, with a program set up in 1979. The environmental message is emphasized at every briefing, there are different bins for recycling in all the public areas, water is all recycled and you are encouraged to reduce and reuse as much as possible. The passenger makeup varies tremendously, and it is hard to pick a "type" or even one nationality. The majority will hail from the U.S., the U.K. and Germany. There are a mixture of tour groups, multigenerational parties and couples. Ages vary from early 20s to late 70s, and during school holidays, you'll find children onboard. The one thing that unites everyone is a sense of adventure and curiosity. Announcements are in Spanish and English, with passengers divided by language (Spanish speakers, and everyone else). The ship is sociable, and you'll soon find you'll get to know fellow passengers. Expedition wear is the attire throughout the day -- shorts, hats, long pants if you're about to head off on an excursion and sturdy walking shoes. At night, it's "cruise ship casual," so avoid bare feet and T-shirts, but shorts and sandals are perfectly acceptable. There is no formal night, and no one is overly concerned about what you're wearing, even at night. The currency onboard is the US dollar. The recommended daily guidelines per person are $13 per day, for the crew, and $10 per person, per day for your guide. Tip the bartenders as you see fit. 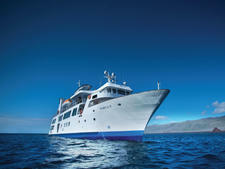 Metropolitan Touring's 48-passenger La Pinta is a year-round Galapagos-based island hopper. 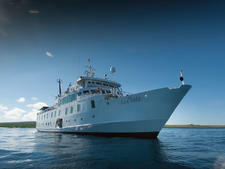 The cruise yacht provides an effortless means of experiencing the Galapagos. Metropolitan Touring's 40-passenger Isabella II is an expedition yacht offering year-round cruises in the Galapagos Islands. The former supply ship was built in 1979 and reconstructed for Metropolitan Touring in 1988.